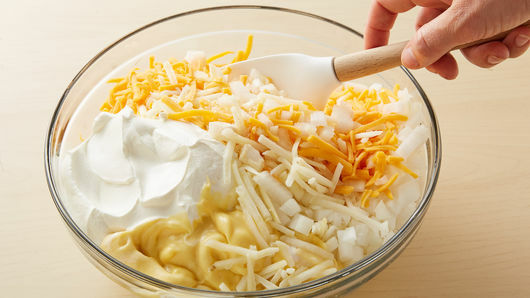 In large bowl, combine 1 pint (2 cups) sour cream, 1 can (10 3/4 oz) condensed cream of chicken soup, 1/2 cup melted butter, 1 tablespoon garlic salt, 1 cup chopped onions, 1 bag (30 oz) frozen country-style shredded hash brown potatoes, partially thawed, and 2 cups shredded Cheddar cheese (8 oz); stir until well blended. Pour into ungreased 13x9-inch (3-quart) glass baking dish. Mix up the creamy potatoes and spoon them into a large slow cooker. Cook them on LOW for 4 to 5 hours, stirring occasionally. Transport them to a potluck or set them out on a buffet for a brunch. Sub in a large bag of frozen southern-style diced hash brown potatoes. Their chunkier texture holds up well whether baked or slow cooked, and they’re a good partner as a side dish to roasted meats. Make up the recipe the night before serving, cover well, and refrigerate until 30 minutes before you’d like to bake it. Let it warm up a little, slip it into the oven, and prep other more last-minute menu items. Sprinkle the top with chopped green onion or a handful of finely chopped parsley or other fresh herbs before serving. Cheesy potatoes go by many names. 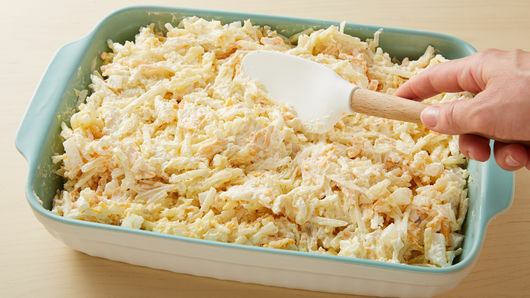 Whether you call them funeral potatoes or party potatoes, one thing is clear: everyone goes back for seconds when this dish shows up at the party. You can make cheesy potatoes a number of ways by changing how you make them or what you use to make them. They can be made as a casserole in the oven like this recipe or they can be prepared and cooked in your slow cooker. You can also use frozen hash browns like this recipe or you can use diced breakfast potatoes. If you’re looking for a way to make the recipe your own, try mixing in diced ham, green chiles or adding crunchy Corn Flakes on top. This classic holiday recipe is a superstar side dish, but it can easily stand in as a main dish, too! 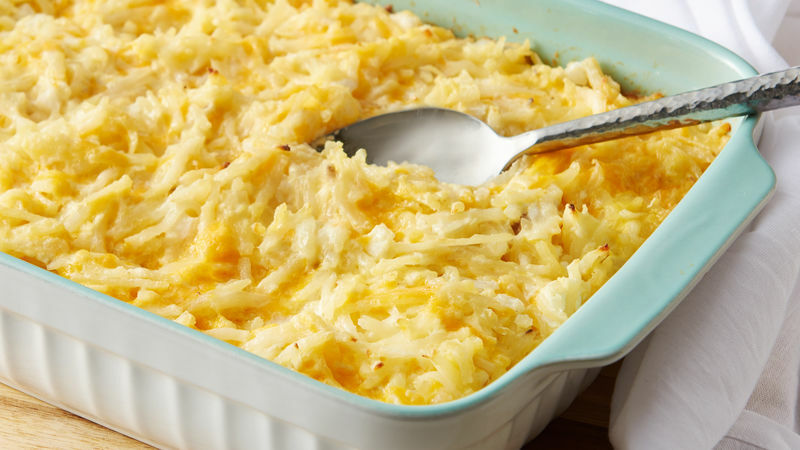 We wouldn’t blame you if you wanted to make this cheesy potato recipe every night of the week, but just in case you want to change up your routine a bit, here are a few more potato side dish ideas Or if you’re in need of a foolproof, quick side for a weeknight meal, here’s how to make the most perfect baked potato.